In food processor or gallon-size resealable food-storage plastic bag, place granola bars and nuts; process or pound with meat mallet until crushed. In small bowl, stir yogurt, whipped topping, coconut and grated baking bar until well blended. In another small bowl, gently toss chopped mango, pineapple and honey until coated. 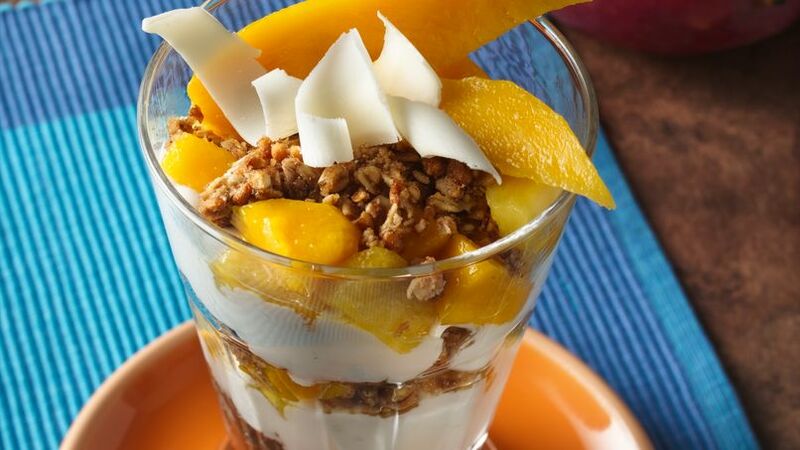 In two 12 to 14-ounce tulip-shaped parfait glasses, alternately spoon about 3 tablespoons granola mixture, 1/4 cup yogurt mixture and 1/4 cup fruit mixture; repeat layers. Top parfaits with remaining granola mixture. Garnish each with white chocolate curls and two mango slices. Serve immediately. Any 12- to 14-ounce tall parfait, dessert or wine glasses can be used.